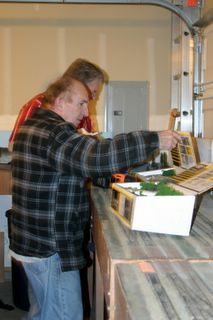 We are working very hard to get all the modules up and running before we show at the 2006 GWAATS in Boise Idaho. The show is March 25 and 26. We have had a couple of banner months for new members. January brought us Norm and Shirley Rees, Matt Farnsworth, Ed Meeham, and Linda Robinson. So far the first couple of days of February has brought us Dan Ward, Sam Kropp, Bob Smylie and Hayden Lewis. With growth like this we will soon exceed most other club memberships in the area. 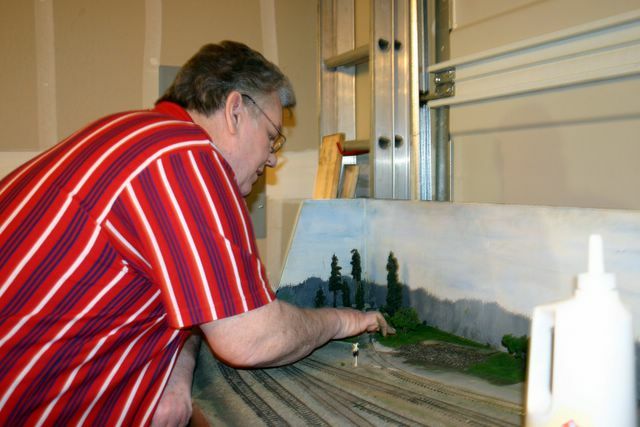 We GREATLY appreciate each of you and all you are doing to make Ida-HO Model Railroaders the standard by which all other local clubs will be judged! WELCOME NEW MEMBERS!! FIRST OUT OF STATE TREK PLANNED FOR OCTOBER! Yes, we will venture out of state for the FIRST TIME in October to display at the Great Atlantic and Western Train Show in Ogden Utah. The dates are October 22 and 23. We will be busy AFTER the March show getting room rates and such. This will be a golden opportunity to spread our success out of our area. I know not all of you will be able to go, but we will need a fair size group to set-up and run for the 2 days. We should arrive mid day Friday the 21st for set up and be running by that evening. We will keep you posted on travel arrangements. So far I have commitments from Bill Sandrus, Norm and Shirley Rees and Mike Quinn. This will be a lot of fun! EDITORIAL: Politics can ruin a good thing. Over the past 2 or 3 weeks I have had the misfortune of reading and responding back and forth via e-mail with a branch of a national organization that represents our hobby. It has REALLY confirmed the suspicions that I always had about how these member supported national organizations operate. It started when I attended a local group meeting and they were supposed to be planning and discussing a local event. It was very apparent from their first words that they had little to no desire to actually work at making the event successful. In fact, there was more grumbling about all that must be done than there was about how to organize the event. I proceeded to write their local leader a letter stating that their group had no interest or desire and that, my friends, fueled a 2 week long mud slinging contest like I have never been a part of. The constructive criticism that I passed along was immediately reduced to an all out “blame-a-thon” between their leader, their group, and myself. It got so ugly that some began using foul language and even pulled out from the group. As I sat here reading and re-reading and even responding to a select few of the e-mails that were shooting back and forth like enemy bullets, I thought of how our group is so much different. And yet we share the same interest! It was a dramatic wake up call to me just how fortunate we are with each other’s friendship and just how much energy, enthusiasm and loyalty we have amongst our group. My friends, when Bill, Larry and I started this club a year ago there was ONE and only ONE requirement: that was that no matter how successful we got or how many members we gained, we would NEVER have the politics that run so rampant in most other clubs. After a year we have held true to this and will for the clubs life! We have witnessed first hand what can happen when appointed officers take leadership and turn it into a circus act. In one of my final e-mail replies to this other group, I stated that my role as the club coordinator only made me different from all of my other members because I keep track of our membership records and write most of the newsletter…that’s it! I said, “I am a member of my own club and work along side of my other friends equally”. This whole experience has weakened and possibly ever severed any tie we would EVER have with the other group, which is sad because we do share the same hobby. It just proved that we haven’t forgotten how to have fun and, with the quality and caliber of each of you, I am positive that we’ll never forget! I am grateful to each of you for the friendship and dedication you have shown. As I have said many times before, we truly have a “Dream Team”. Bill Sandrus has been hard at work searching out every vacant storefront and such that we run across. I have personally given him a half dozen names and phone numbers so far. We will keep you up to date as things develop. 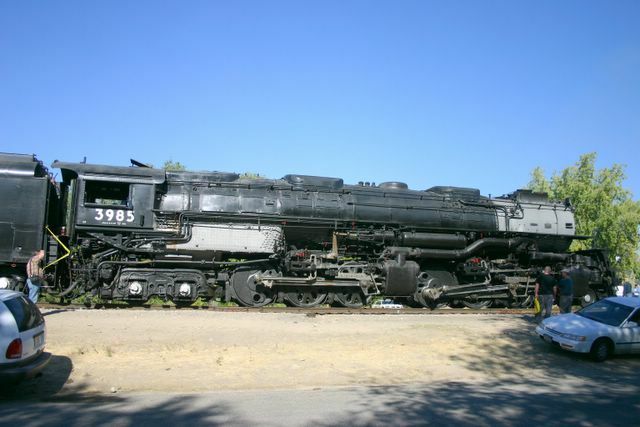 PLEASE, if you see something that looks like a good train location, call or e-mail me and I’ll get it to Bill. 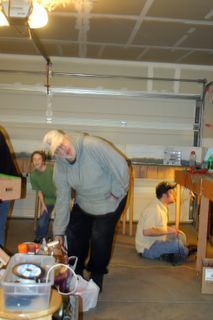 As you have seen, we are really crowded in my garage! Thanks friends! 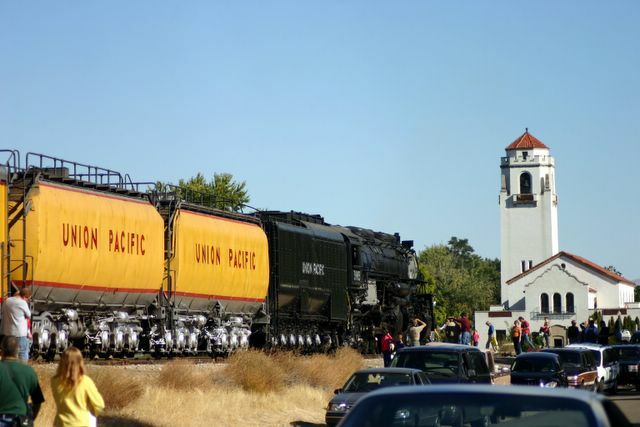 With weekly meetings now and a fantastic turn out at every one we are progressing very rapidly toward the March 25th and 26th Great Atlantic and Western Train Show here in Boise. 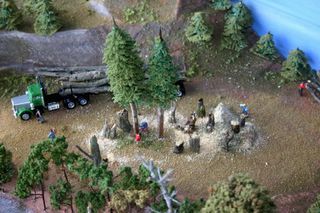 In just the past 4 or 5 weeks we have spruced up scenery, built 2 corner modules, rewired part of the layout, constructed a log pond, developed an area for a drive in theatre, created a small roadside village, repainted sky boards, built a lift-up bridge, built several buildings and mini-scenes and continue to plan for the future. We still have some rather large projects to complete but we will make it! 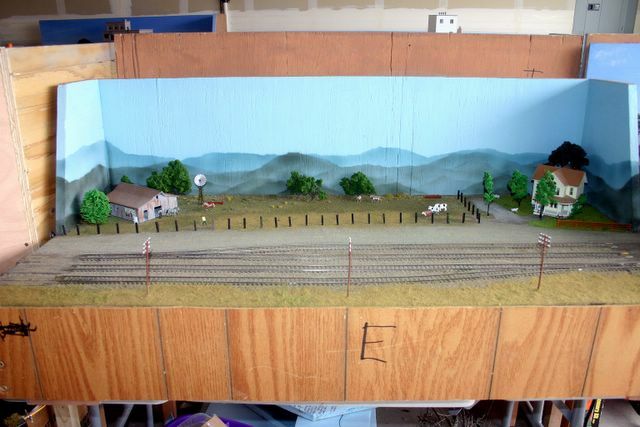 We need to replace all the fascias, finish the re-wiring project, complete the 2 corner modules scenery including a forest/logging area and the row crop/farming area and biggest of all, put the layout together at least a couple of times to see how it runs, and how well it will set up. I am REALLY excited as March draws near! KEEP UP THE GOOD WORK!! 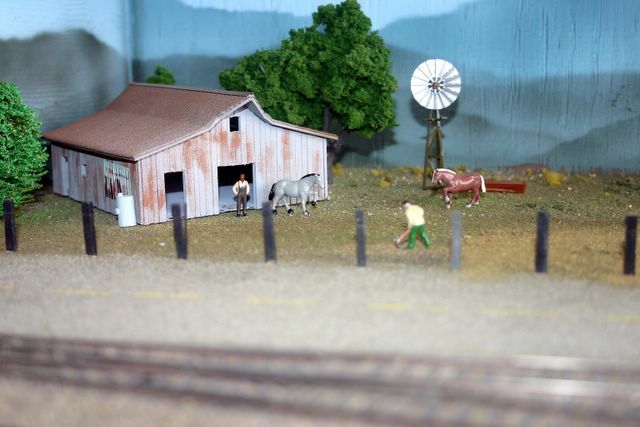 IDA-HO MODEL RAILROADERS IS ONE YEAR OLD! It’s hard to believe that it was one year ago this month that I half seriously said something to Bill and Larry about starting a club. Then I got to thinking about it and talked with them and thought, “why not”. With a great deal of encouragement from my lovely wife, Heidi, Ida-HO Model Railroaders was born. 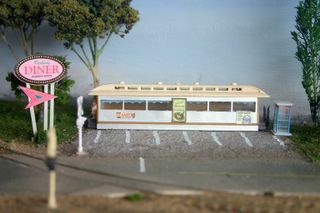 Now one year later we are topping 30 members, still collect no dues, have 2 modular layouts to keep us busy, are just about to display in our 2nd public show, have committed to our first out-of-state show in October and STILL HAVE A LOT OF FUN!! Thank you friends/members for a fantastic first year. We hope to have many more to come!! 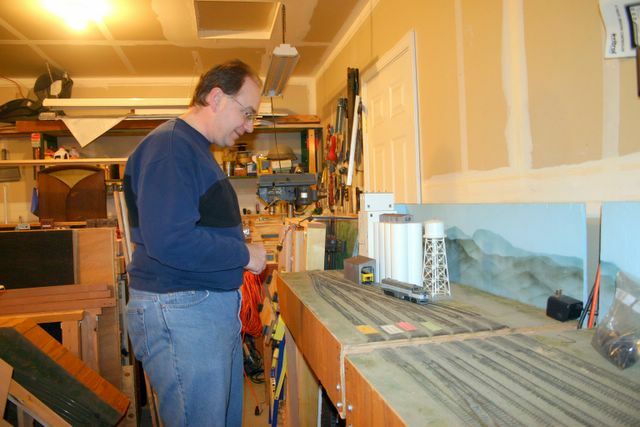 MODEL RAILROADING- THE WORLDS GREATEST HOBBY! 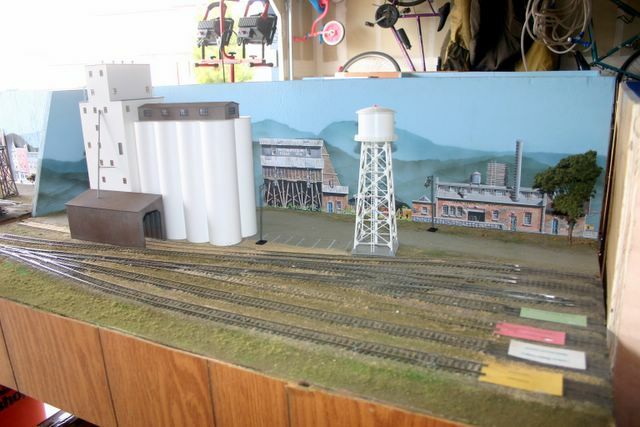 Duncan Campbell of Campbell Scale Models is offering IMR Members a 20% discount on all Campbell Scale Model products if we order direct from him. Member Norm Rees had a very nice conversation with Duncan who, by the way is the new owner, but NO relation to the original Campbell’s. Duncan is getting back into full production after some time due to a death in the family. 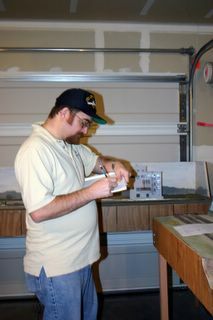 He has a healthy back order log but said he will be working hard on productions of several of their craftsman structure kits. If you have never built one of their kits, they are truly a work of art when completed. Most are 100% wood with some cardstock sub-basses and a lot of cast details. 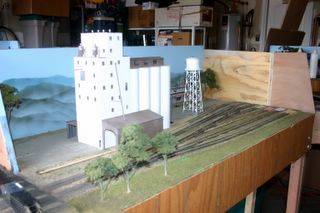 Write to Campbell Scale Models at PO Box 3547 Central Point, OR 97502 or call Duncan at 541-664-9296. Make sure to mention you are an Ida-HO Model Railroaders member! 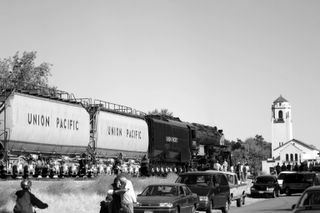 IMR TO HOLD MODEL RR SWAP MEET! One thing I have greatly missed in my 10 years here in the valley is a good old-fashioned swap meet! When I lived in the southern California area we had many swap meets every weekend. 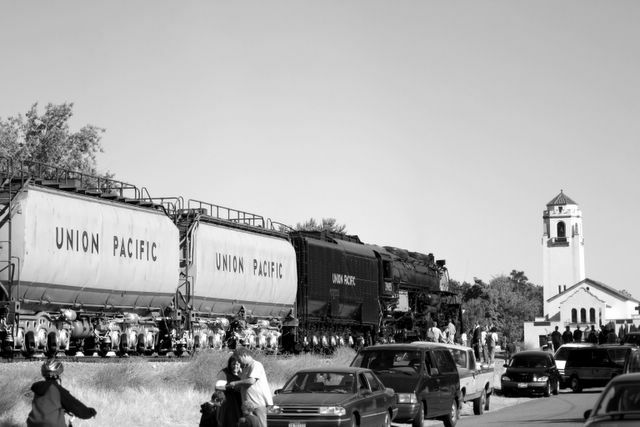 We even had a train swap meet once a year at the local Goodwill store. Since we seem to have enough interest in the idea, I have decided to try one on Saturday May 13th from 10am until 3pm at HobbyTown USA. We will be setting up in the back room and “vendors” are responsible for their own sales, monies, change and receipts. There is no cost to attend or sell! If you have items that you’d like to sell or trade please let me know by May 1st so we can get an idea just how many tables to set up. 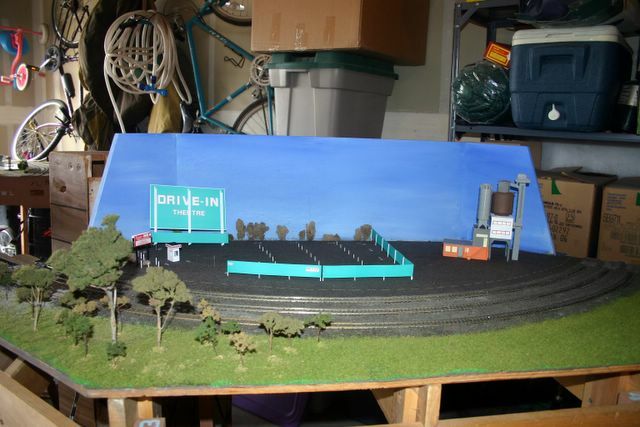 Mike Quinn, Joe Schram, Ken Young and several others have been talking about an internal staging yard for the donated layout, and I am excited to see the ideas. 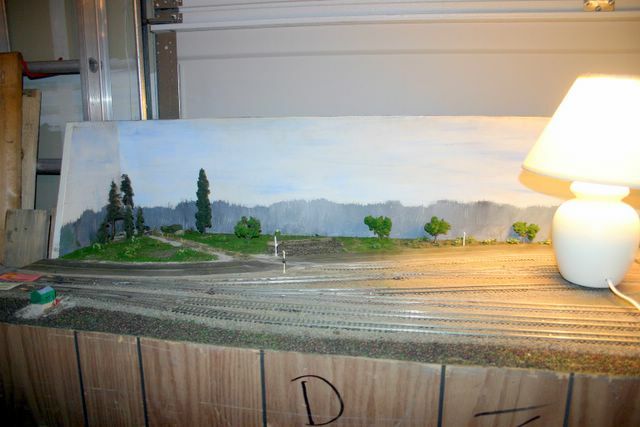 What we have envisioned is 2-2’x6’ sections in the middle of the layout that will serve us as a staging area and place to store rolling stock and make up trains. We have talked of mainline access from both directions and a portal through the sky board and into the “hidden staging area”. Mike has submitted some sketches to me and several of us have talked about this. I think it would be a great addition to the layout and Ken Young has gone so far as to pre-buy a lot of Shinohara switches just for this project! More to come! IMR CLOSES IN ON FIRST ANNIVERSARY! What a year it has been! It’s hard to believe that 2006 is here and that IMR has been in existance for 11 months! It seems like it was just a few weeks ago when Bill, Larry and I started talking about getting a club together. We have made giant steps this year. Some of the highlights include our first public appearance at Cherry Lane Christian Church where we had a static display on a card table, but got Maurice Allen and Ben Bolshaw from this meeting. Then we began having regular meetings and devised a plan to build a modular layout. Chris DeWitt and his amazing shop and wood working talents gave us the framework for a large modular layout. 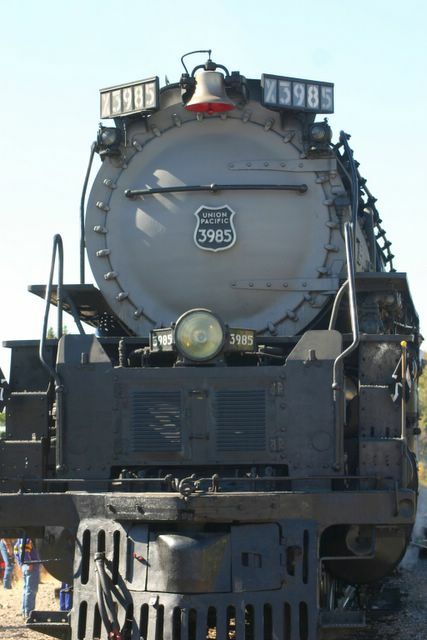 We toiled and sweated through the summer months and had our first public display in September at the Caldwell Depot. We learned a lot about the layout and what we need to do to improve it there. 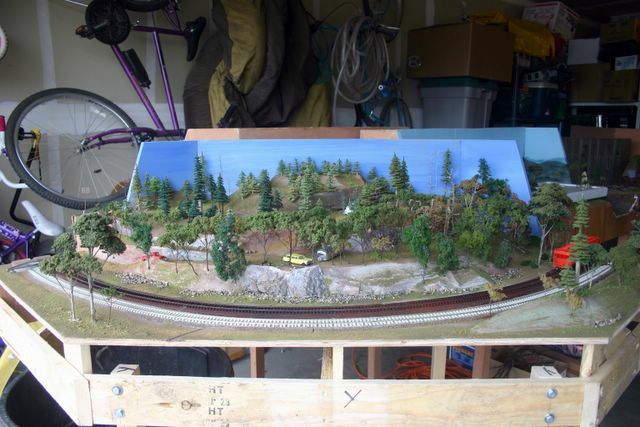 In October, Ken Young and I travelled to Canyon City, Oregon to pick up another modular layout, donated to us by Everett King and the Canyon City ‘N’gineers. 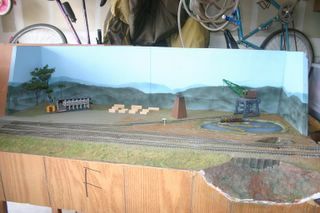 Now we are in the process of getting the donated layout ready for it’s first IMR showing in March of ’06! 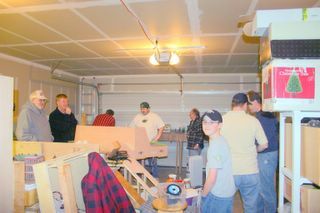 Our membership has grown from 3 to about 16 and I have been telling everyone I meet in HobbyTown USA about the club. Amongst our members we have masters in nearly every aspect including wiring, benchwork, track laying, details, scenery and operation! 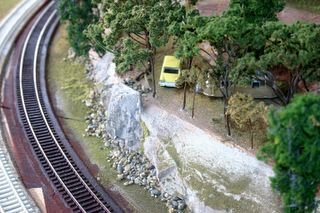 I must say this…I am proud to be the coordinator of Ida-HO Model Railroaders and am so grateful to each of you for being a part of our club. My wish is that each of you and your family have a healthy and prosperous New Year! FIRST CHRISTMAS GATHERING A HIT! Our first Christmas gathering was a hit with most of you and your families here for a fun evening of food, warm drinks and a great gift exchange! Thank you to each of you that brought something to eat and the gift exchange was so much fun! We will do this again this year for sure! DONATED LAYOUT GETS A MAJOR FACE LIFT! 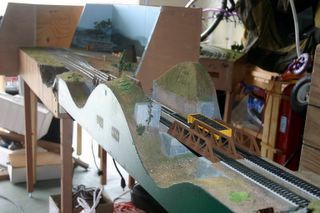 Work has begun on a major overhaul of the old Oregon Western Lines layout that was so kindly donated to us last October by Everett King. Once we got the jist of how it goes together, Bill and I set forth building 2 new corner modules to complete our huge “loops”. Mike Quinn is adding to the layout with his 2-2’x6’ modules depicting modern intermodal operations. Jason Parker and Mike have began construction of a scrap yard complete with corrugated tin fence and a gantry crane. I have built a ranch scene, and am also building a rural general store, motel and drive in theatre scene too. Bill did some GREAT scenery around a planned roadside diner, which I will build later. Larry Thomas has visions of a forest and logging operation and Ken Young’s donation of 2 beautiful Walthers kits, a flour mill and grain elevator have really livened up the ends of each yard area. While all this cosmetics is happening Jeremy and Darby Light have been busy “under the tables” revamping the wiring and Jeremy has a great start on our new controllers! 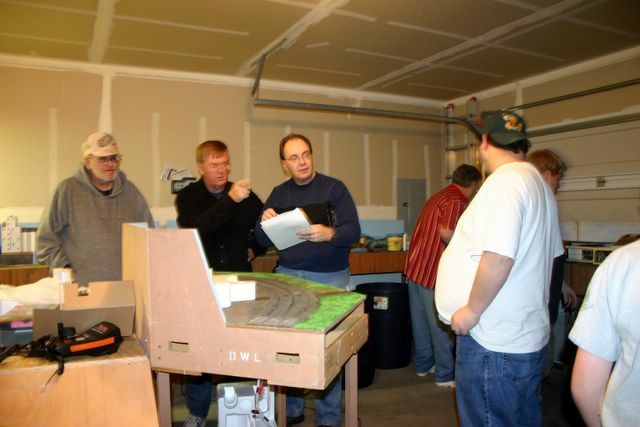 Guys, the other night at our first meeting of 2006 I saw the enthusiasm of everyone peak as we started rebuilding the layout! The energy, camaraderie and fun was the best I have ever seen! It is what I have visioned since our inception a year ago! THANK YOU ALL for your talent, friendship and patience! JOE PATNODE MAKES ANOTHER DONATION TO US! During our meeting of January 4th, Joe made a quick trip home and returned with 2 bags just full of scenery materials to donate to the club. 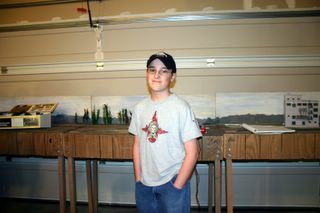 Along with that he donated some great videos on scenery from Woodland Scenics. It is so wonderful to see the generosity of you all towards an award winning layout! THANK YOU JOE!! 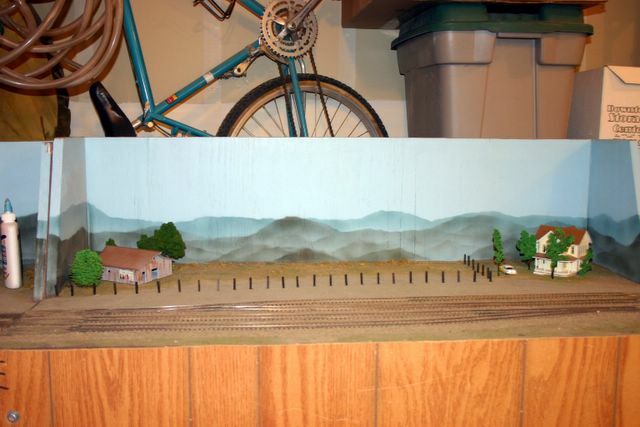 While a lot of our time has been and will be focused on the donated layout, we must not forget our first layout. Although we had some issues at the Caldwell showing, it served us well and was a definate crowd pleaser. 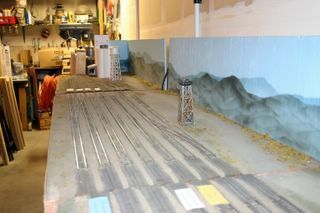 With this being said, I’d like us to focus on rebuilding the tops on that layout AFTER the March GATS show. I think the easiest way to correct the sagging top problem will be several sessions here at my home before the summer heat sets in taking the soundboard tops off each module and placing a piece of 7/16th inch OSB under the tops as a base and then reattaching the tops back on the frames over the OSB sub base. This will stiffen up the tops and add just a bit of weight overall. The original frames were designed for 1” pink foam tops and when that became unavailable I opted for the sound board. I admit that I never thought it would be so weak on its own, but we can fix it and with little damage to what we have already done on the layout. Any other ideas and suggestions are always welcomed. 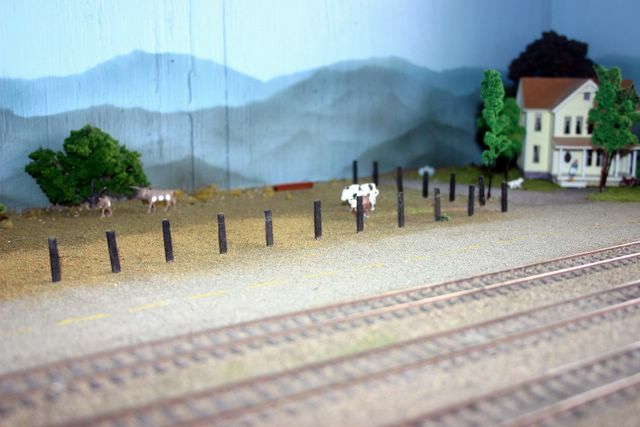 Jeremy has said that he thinks we should replace the original connectors because they are no longer available and 2 or three of them failed before we displayed the layout in Caldwell. He said the plastic computer connectors are not expensive and we should get a lot of years of service from them. I also will rebuild the turntable and yard area to be more versatile and useful and the temporary panel will be replaced with a permanent and labelled version! I’d like to see some of the blank modules filled up with some various geographics like mountains, valleys and water. I’d also like to add sky boards to the back and a removable staging area behind the skyboards. What are your thoughts, ideas and visions? SANTA WAS GOOD TO ME!! YOU?? Well, I must have been a very good boy this past year because old St. Nick was very kind to me this Christmas I got several new freight cars including plug door cars for Nestle and Jewel Tea, plus 40’ box cars like the beautiful PRR Merchandise Service car and MP Eagle Car. And, best of all I got my beloved New Haven GE E33 electric locomotive made by Spectrum. Boy I can’t wait to run this beautiful loco with a nice New Haven consist in tow! CLINICS COMING UP THIS YEAR! We had a terrific response to Ken Young’s clinic last year on improving rolling stock with Kadee couplers and steel wheels. This year I have included 3 more clinics that I hope will be as good! Our first will be after the March GATS show and will focus on the use of an air brush to weather rolling stock and locomotives. I will also touch on painting, decalling and other methods of weathering using chalks and charcoals. Clinic two will be on making trees. I will show you several methods using readily available kits and materials to make realistic decidious and evergreen type trees. This clinic will be a “make and take” which means any trees you make, you can take home with you. 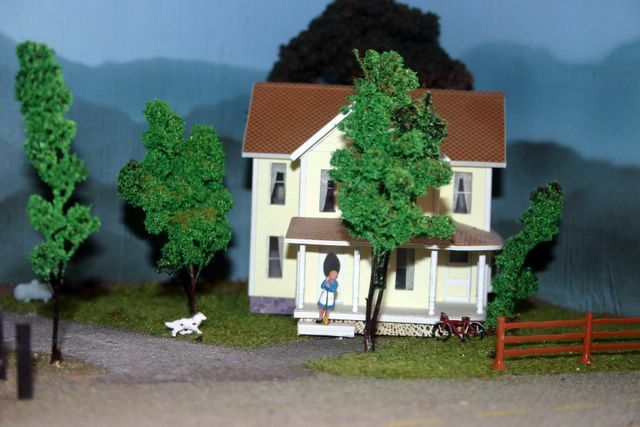 I have a special tree making kit from Woodland Scenics and a plethora of other tree making tecniques to share with you! 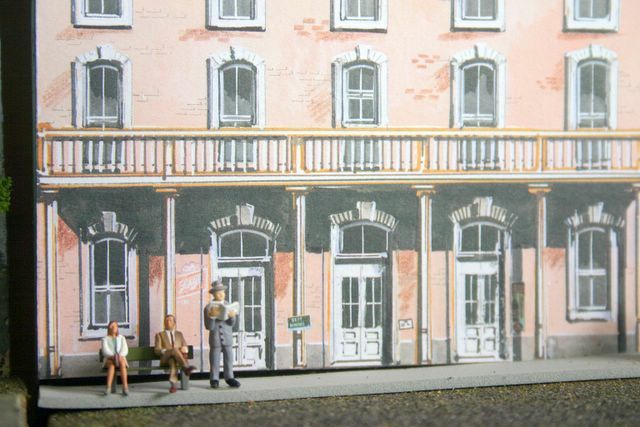 Finally, clinic three will be on scratch-building structures. 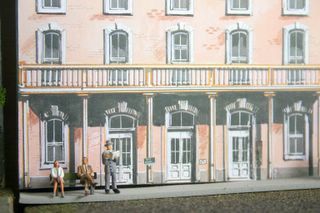 We will go from plan or picture to finished model using my favorite building medium, cardstock! I will share many tecniques I have learned over the last 35 years and show you many materials that are available very easily and inexpensively. Anyone having experience and/or ideas for any of these planned clinics, please let me know and you can co-host with me. Next year I am hoping to have clinics on tunnel portal and bridge making, replacing Athearn “cab lights” with real head lights and creating realistic loads for open cars. Other ideas are always welcomed too! MEMBER SCOTT CHAMBERLAIN AWAY IN ICELAND! New member Scott Chamberlain, our other PRR modeler is away for 4 months on a TDY in Iceland, but he is able to keep in contact with us via e-mail. 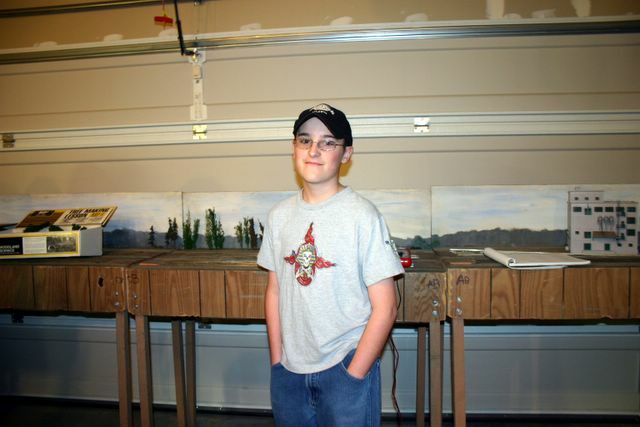 Scott came to us through a chance meeting at Hobbytown USA. After talking a bit I found out that he and co-founder Bill Sandrus are from Altoona, PA. I just had to get them 2 together and it has been a great experience having Scott in the club. He and his lovely wife, Britta just bought their first home here in Boise and Bill and I got a preview. 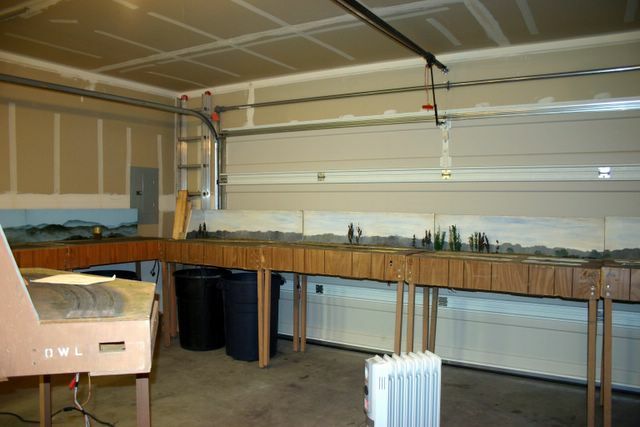 It is adorable and has a very nice sized basement that will soon start filling with Scotts PRR Altoona/Juniata Yard layout. Scott models the 1950’s PRR line with both steam and early diesel power. He has amassed a very sizable livery and is very excited about his future layout. Britta and Heidi hit it off well at our Christmas gathering as Britta is beginning scrapbooking which is Heidi’s hobby too! It is members like this that make us so great!! Good luck Scotty, we’re proud of you!! "lets see, the red wire goes to the blue wire?" Bill wiping off a little "earth"
GREAT ATLANTIC AND WESTERN TRAIN SHOW RETURNING TO BOISE! The Great Atlantic and Western Train Show, formally GATS will return to Boise on March 25th and 26, 2006. Late last year I spoke with a representative of GATS and they said they’d “never return to Boise due to poor attendance”. Well, since their restructuring took place earlier this year, they have set forth with a very aggressive schedule for 2006. In some instances there are 3 shows on the same weekend in different parts of the country! We will be a part of the March show by displaying our recently donated layout for the first time. 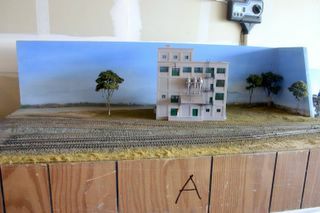 Work has already started on the layout, Jeremy is working out the wiring maze and rebuilding the hand-held controls, I am getting buildings and details ready and soon we will meet at my home to put it together and see if we can get something running on at least part of it! 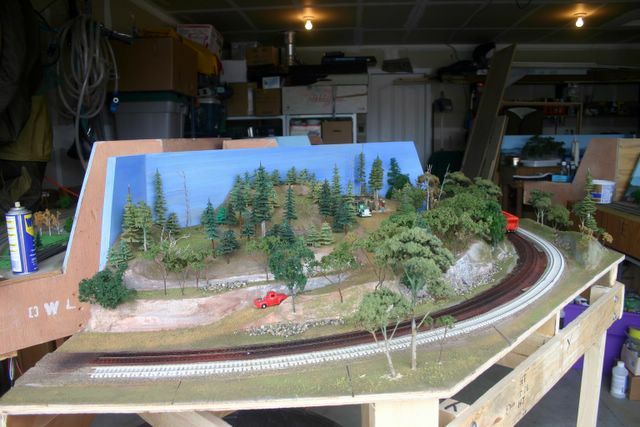 In addition, new members Joe Schramm and Michael Quinn want to build 2 12’ additions to the layout featuring modern day intermodal operations. This will increase the size of the layout to 24’ x 24’! That’s’ huge!! We have a lot of work ahead of us, but quite a bit more time then we had for the Caldwell show. We ALL must help in the preparation, testing, set-up, operations and tear down of the layout to make it a sucessful time! As a little incentive, I have secured 20 FREE passes to the 2 day show. ALL THOSE WHO HELP WILL GET A FREE PASS FOR BOTH DAYS! Those that commit to set up have a great advantage as you will get first gander at dealer tables and be able to strike some great deals FIRST! So far I have commitments from Jeremy, Bill and Ken! Who else wants to save 8 bucks and get first crack at the train deals??? Our next meeting will be at HobbyTown USA on Wednesday November 30th at 6:30PM. I have decided to hold off on the clinic until we get something more done on the new layout. 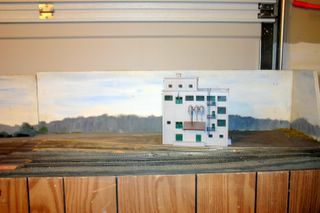 I will try and get a couple of pieces to the meeting and that way you will all be able to see at least a part of it! 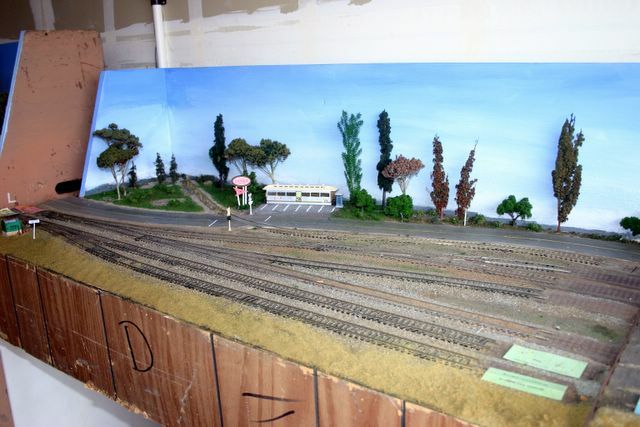 With our great expansion recently, IMR is desperatly in need of a location where we can leave the layouts stored and ideally set up! My garage just isn’t big enough to set up the new layout and it would be nice to have a permanent spot we could all have access to. With that said, I have written letters to all major property management companies in the area and also the Kuna school district seeking their help in a donation of a space for us on an annual basis. So far I have had no response, but I will continue looking and something will turn up. The Kuna school district was suggested by Joe Patnode because they have recently moved their bus barn to a new location and the old location is now vacant. Thank you Joe for the suggestion, I would have never thought of that! If ANYONE has ideas or suggestions, PLEASE let me know so I can pursue them. We need about 1000 square feet on one floor(preferably the ground floor), we can provide liability insurance. PLEASE LET ME KNOW IF YOU HAVE ANY IDEAS OR SUGGESTIONS!! OCTOBER MEETING AND CLINIC A WINNER! Our October meeting, the first at HobbyTown USA, was a huge success and mostly thanks to Ken Young and his most informative clinic on weighting cars, steel wheel and coupler replacement! 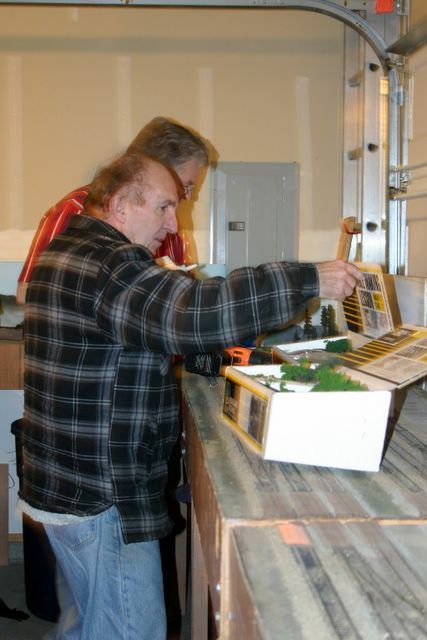 THANK YOU KEN for showing us all how to have flawless operating rolling stock like you do with some rather simple adjustments to even common brands of freight cars! We learned that proper car weight leads to better tracking and stability which results in no derailments and no more wobbly cars. Also Ken shared tips and techniques on replacing plastic wheels with smooth rolling and perfectly balanced steel wheelsets and how to “ream” journal boxes for better rolling cars. Also the addition of Kadee couplers makes for more realistic appearing cars, and much better reliability than those old horn-hook couplers ever did! 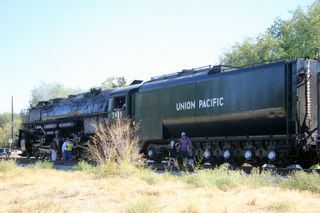 With all the rolling stock we have in our own collections this was a great clinic! On Friday December 16th we will host a Christmas gathering for members and their families at my home in Kuna. We will start at 6:30PM and since it’s a Friday it can go later than during the week. We will have a “goodies” potluck, bring your favorite homemade or bought “goodies” like cookies, fudge, chips, dip, etc. Heidi has promised a couple of her own special recipes and we will have coffee and hot cider as well. Along with this we will have a gift exchange between members. We will draw names at the next meeting and Heidi and I hope all of you and your families can attend. Oh yes, gift exchange limit is $10.00 or less, please! Guess that’s enough. How about you? Let me know and I’ll publish all responses in the December Newsletter! MAKE YOUR OPEN CARS WORK FOR YOU! Do you have open hoppers, gondolas and flat cars that are empty? Why? Loads are easy to make and there are nearly endless possibilities of materials and products that are transported by train. I was inspired by Ken Young’s most realistic coal loads in his 42 car DRG&W coal consist at the Caldwell show to look at ways to “load” my hoppers. Well, it didn’t stop there. After doing some of my hoppers, I filled some of Bill Sandrus’ cars and then began to think about loads for gondolas and flats as well. Here’s what I came up with so far. I made a scrap metal load for gondolas by glueing a bunch of old HO parts on a sheet of styrene the exact size of my gondola floor, then painted the whole load a rusty red color(red auto primer works well!). If you have a lack of small parts you can get old electric alarm clocks(not digital) at the thrift store and use the gears and parts from them to create a realistic scrap metal load. I have also filled a couple of gondolas with coal and they look quite real! As for flat cars, they’re open to just about anything you can think of. Common loads may be lumber, metal, paper rolls, army tanks, trailers, heavy equipment, pipes and large machinery. 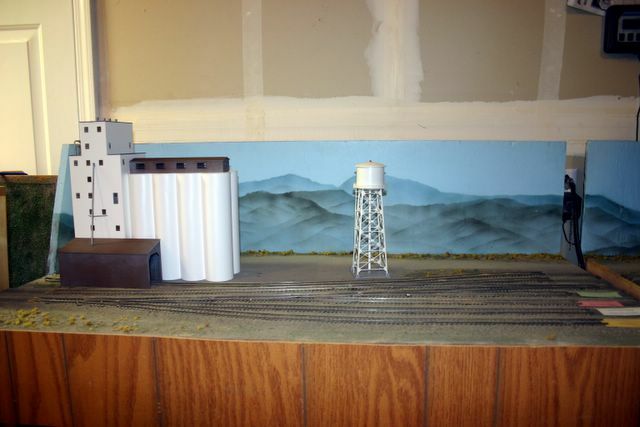 I recently bought a kit from Walthers of various size air conditioning units, two of which made their way onto an empty flat car of mine. The kit which I bought off the HobbyTown clearance table makes 12 units, which will fill four 40 foot flats nicely! More unusual loads may be aircraft, large yachts, generators, turbines, jet aircraft parts, automobile frames, and slabs of marble. 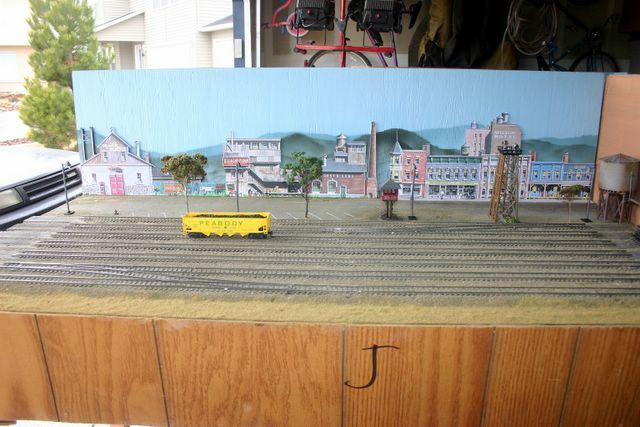 Ken Young has a very nice depressed center flat car that will get a load made from an air filter for a lawnmower. It looks great! 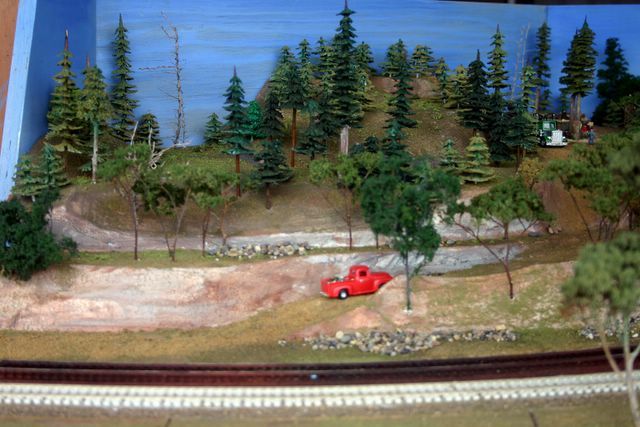 One of my favorites is my depressed center die cast flatcar that carries my 1967 Lima Steam Shovel that my dad bought me when I was a kid. I also have a very nice Westinghouse depressed center car with a huge generator load that was made by Marx in the early 1960’s. 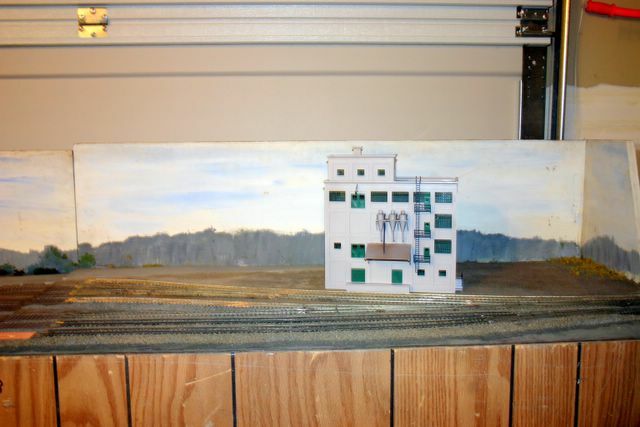 I have several heavy duty flats that I will add Army tanks to which will be an interesting load. Perhaps we should have a clinic next year on making car loads?? Ida-HO Model Railroaders Meeting and Clinic Calendar 2005-2006November 16th MEETING 6:30PM(new layout) HobbyTown USANovember 30th CLINIC: Weathering Locos and Rolling Stock HobbyTown USADecember 7th MEETING 6:30PM(new layout) HobbyTown USADecember 21st CHRISTMAS GATHERING Al Babbitt's Home2006January 4th MEETING 6:30PM(new layout) HobbyTown USAJanuary 18th MEETING 6:30PM(new layout) HobbyTown USAFebruary 1st MEETING 6:30PM(new layout) HobbyTown USAFebruary 15th MEETING 6:30PM(new layout) HobbyTown USAMarch 8th MEETING 6:30PM(new layout) Al Babbitt's HomeMarch 15th MEETING 6:30PM(new layout) Al Babbitt's HomeMarch 22nd MEETING 6:30PM(FINAL PREP!!) 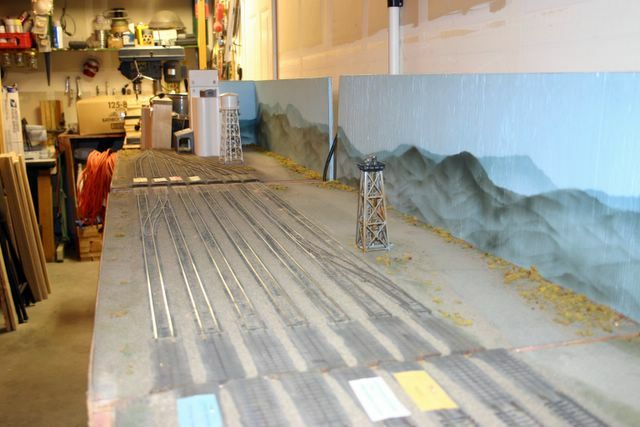 Al Babbitt's HomeMARCH 25th and 26th Great Atlantic and Western Train Show in Boise-ALL MEMBERS TO HELP SET-UP, OPERATE and TEAR DOWN LAYOUT! !FREE PASSES TO THE 2-DAY EVENT TO THOSE WHO HELP!!! CLUB GETS SECOND LAYOUT AS A DONATION!! Ida-HO Model Railroaders was VERY blessed this past week as Everett King donated a huge HO gauge modular layout to us. We now have 2 modular layouts to work on. This new one will need some work as it has been some time since anything was run on it, but it is very complete and we will just need to construct 2 corner modules to complete a 12’ x 24’ layout. It is very complete otherwise including a lot of track and switches and under-table switch machines. 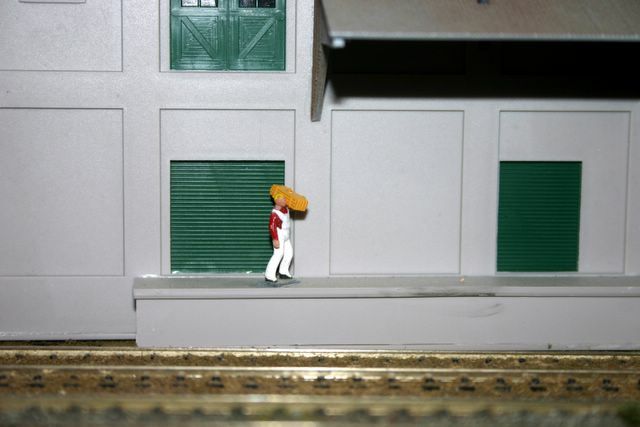 It includes a very large yard area with enough storage track to hold most of what we have in rolling stock! 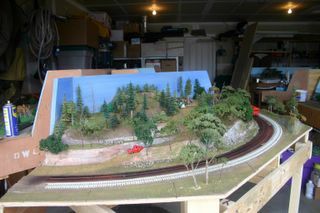 Ken Young and I took the 3 hour trek in the rain to Canyon City Oregon Saturday the 1st to pick up the layout and was given a tour of Everetts train barn and their new N gauge layout as well. Mr. King also threw in a couple of boxes of miscellaneous trains and I have found my treasure in the box…a very old die cast Atlantic steam locomotive that I am restoring. It had been setting a long time and is only missing the cab, and believe it or not, it ran on first try with a transformer and some clip leads connected to it! 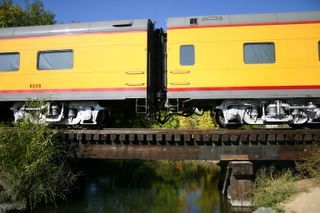 There are a lot of inexpensive diesels in there and some decent freight cars and some small accessories we can use too! 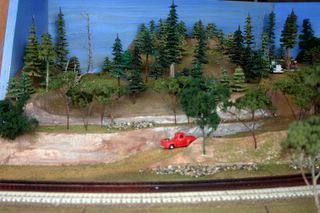 A special thanks to Ken for the use of his truck, trailer and all day Saturday to get the layout. We had a great time talking trains and more trains! I’d like to stress to each of you that have e-mail to take a moment and send a thank you note to Everett for a most generous donation to our club! You may e-mail him at trainbarn@oregontrail.net. 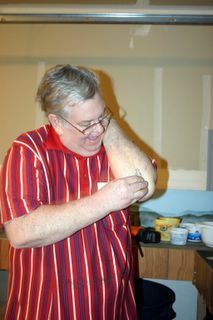 I rallied an e-mail plea for fuel money for Ken and we received $65.00! Almost enough for the entire trip over and back! To those who donated, THANK YOU!! 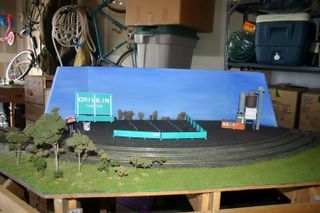 Now we have twice as much to do this winter and we will get one of these layout up and running before our next showing. 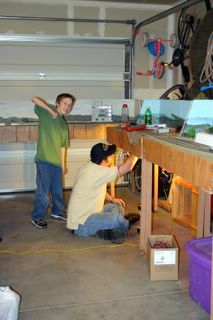 Jeremy has already committed to the wiring task!! FIRST OUTING WITH MODULAR GETS GREAT COMMENTS AND WE LEARN SOMETHING TOO! Many folks, young and old were on hand for the Indian Creek Celebration in September in Caldwell. We were so glad to be a part of it and we really had a lot of fun displaying our modular layout for the first time. Overall it ran fairly well and semed to be entertaining to all those who watched it. Several people stood for long periods watching trains roll past and several asked if my 3 module city was supposed to be vintage Caldwell. We did, however learn a couple of very important things about displaying the layout. #1) It takes MORE than 2-3 people to set up and tear down. #2) We MUST find a better system for the transition tracks between the modules. Setting up really took a toll on Bill and it was no picnic for Jeremy and I as well! 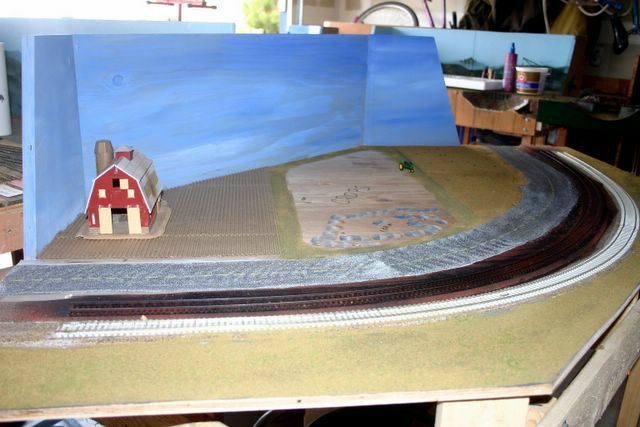 In order to make the system more fair, I think we ALL must take a working role in the set-up and/or tear down of the layout(s). It is unfair to expect the same 2 or 3 people to do all the sweating and then others come in and have fun operating, to then disappear before the thing comes down! My experience with another club reminded me that we always had at least 6 on hand during set up. We need to do the same! Tear down consisted of me, Larry and Jeremy and we were all pretty tired by nightfall. Remember, we are a new club, which means “work in progress”, we must ALL take an active part in all areas of the club to make it fair to each other and to make it appealing to new members! Teamwork will build our membership and morale!! Secondly, Ken, Jeremy, Bill and myself all have slightly different ideas for a better arrangement for transitions between the modules. It seems that the tops are not level and flat to each other so there are hills and valley’s at each joit causing derailments and de-coupling. I have heard such ideas as replacing the top material, building stronger bracing for the tops underneath, shortening the transition tracks to just 2” or so and replacing the tracks with drop-in plates that line up perfectly everytime. We will need some drawings and if possible prototypes of any idea you have so we can make the transitions smoother! Bring them to our next meeting, please!! NEXT MEETING TIME AND PLACE SET!! Our next meeting will be Wednesday October 26th at 6:30PM at HobbyTown USA in Boise. Hobbytown has been kind enough to open their meeting area to us and we will probably hold most future meetings there. It will give us a chance to check out all the new trains stuff I’ve gotten in and secure some fantastic marked-down items too! Be sure to mark your calendars for October 26th! I will be bringing a couple of modules from each layout! 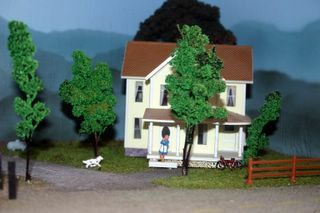 HobbyTown USA is on the corner of Cole Road and Ustick in Boise, next to Ace Hardware and Moxie Java! SEE YOU THERE!!! Ever wonder how hard it is to replace horn-hook couplers? Or how to make realistic trees? 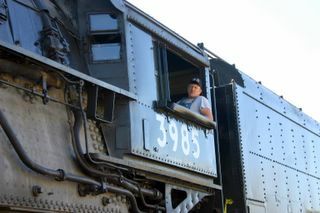 Or how to weather a freight car? Well wonder no more friends! Starting in November we will hold special clinics and all of these topics will be covered plus a whole lot more. 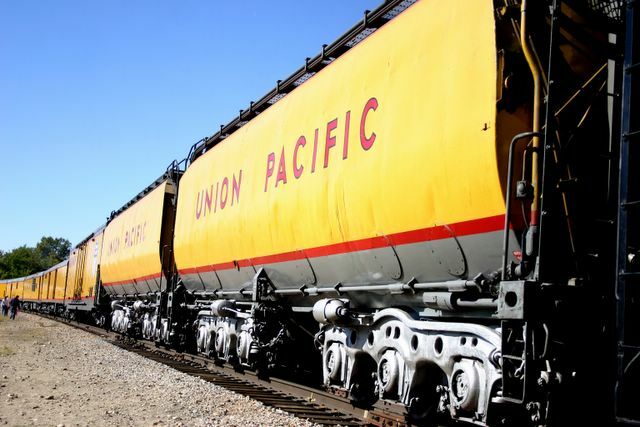 Ken Young has graciously agreed to conduct our first clinic on how to add Kadee couplers and how adding more weight and steel wheelsets make any freight cars perform better. 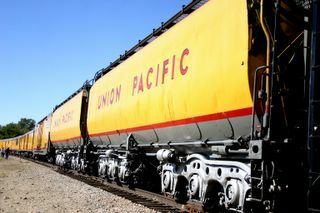 I can personally attest to how even common brand freight cars run better and smoother with additional weight and steel wheelsets. And we all know the benefits of Kadee couplers! 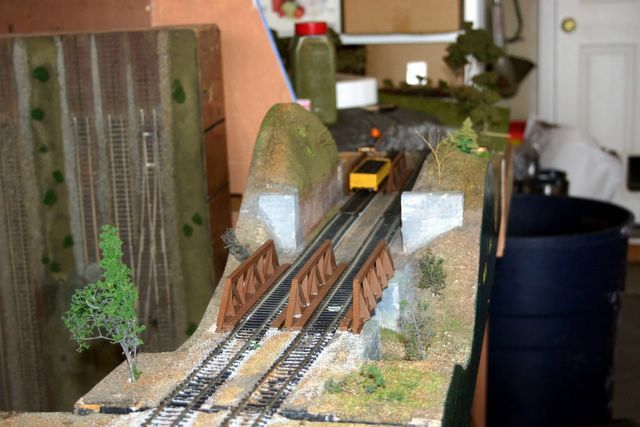 Other upcoming clinics will include, weathering freight cars and motive power with various methods including airbrushing, spray paints and chalks. 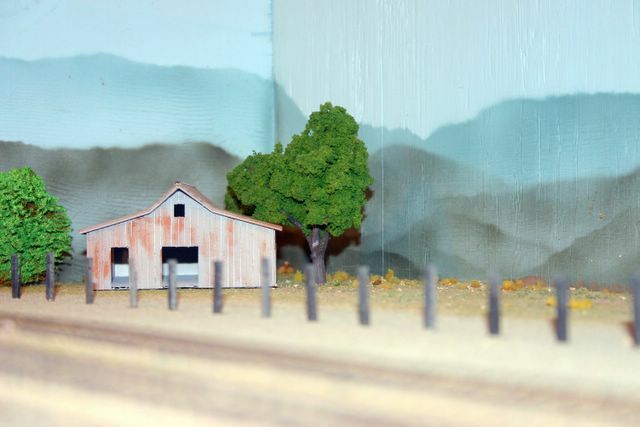 Also, making realistic trees and locomotive maintenance. These clinics will be held in addition to our regular meetings and there is no charge for them! Please plan on attending, I will announce dates by e-mail soon! I mentioned on the front page about the treasure I found amongst the trains donated to us by Everett King. Here’s part one of how I am rebuilding this great old Japanese built 4-4-2 Atlantic to run again! (image placeholder) How she looked right out of the bottom of the box, note the cab is missing and there’s a wire off the motor. MODEL RAILROADING- TheWorlds Greatest Hobby!! 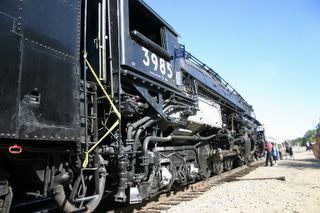 September 25,2005 Union Pacific Big Boy 3985 at the Boise Idaho Train Depot. It was quite the sight. I was able to take my two kids Austin and Ashley to see this magnificent locomotive!!! It was fun to see the kids excitment at the size of it. I must admit that I too was taken back at the size. It was a sight I think we will all remember for years to come. If you were able to get out to see it, you know what I mean. I hope you will enjoy looking at the pictures I took. 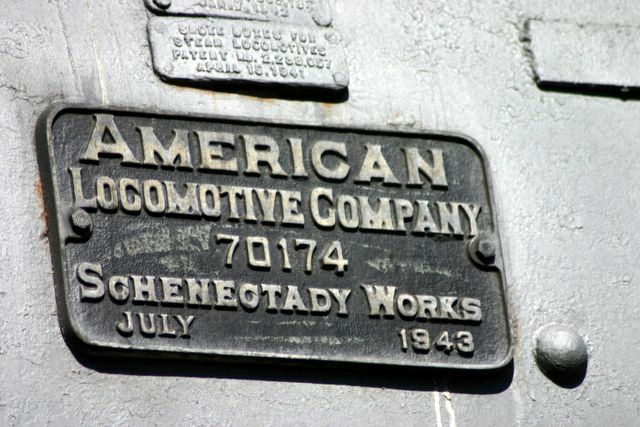 Ida-HO Model Railroaders was started by three friends, Al Babbitt, Bill Sandrus and Larry Thomas. Our club has no dues, no structure, no officers and no prescheduled meeting times. We are just a group of friends that get together and talk trains. Al Babbitt is the "club coordinator". We are currently seeking new members to help construct a club layout. We each have a unique modelling era and road name. Al is 1960's New York Central, Larry is 1960's Rock Island and Bill is 1950's Pennsylvania RR. 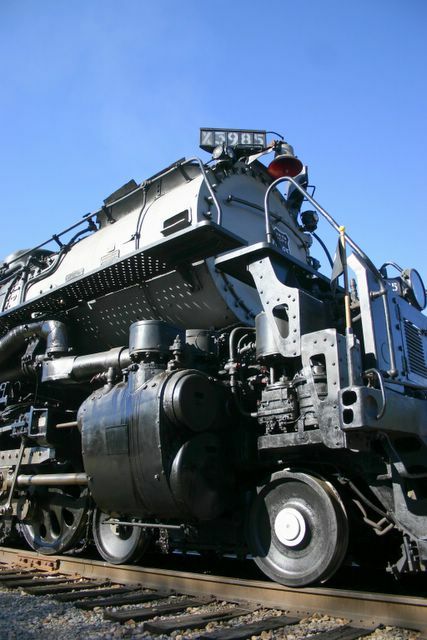 We all run a mix of steam and diesel. We would love to hear your ideas and see your pictures.